An investigation is underway after an explosion hurt six people at a business in Acton, Massachusetts. 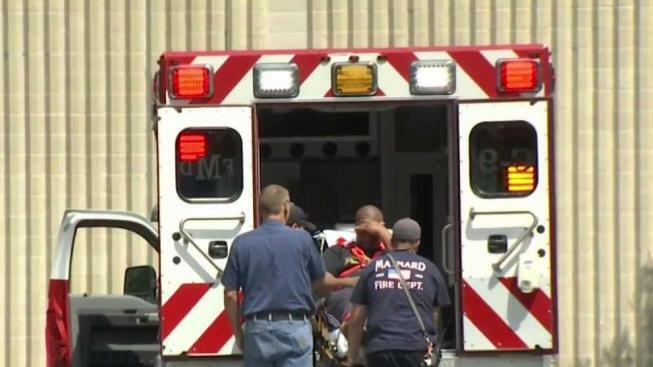 Six employees were hospitalized following a fire at a Massachusetts manufacturing facility on Wednesday morning. One of the employees suffered "severe burns" to his hands and back. Acton Deputy Fire Chief Bob Vanderhoof said they got the call for an explosion with injuries at the Haartz Corporation's manufacturing plant on Hayward Road just before 10:30 a.m. Authorities said one person was hospitalized with serious burns and four for smoke inhalation. The unnamed employee with burns was taken to Massachusetts General Hospital. His name is not being released at this time. Haartz said it is working to get more details on the conditions of the injured employees. A sprinkler system at the manufacturing plant extinguished most of the flames by the time firefighters arrived on scene, according to Vanderhoof. However, the chemicals used in manufacturing products were "quite volatile," which presented some challenges for the firefighters. "The intense flames did extend from the first floor up into a duct system that went into the second floor," Vanderhoof explained. There was considerable damage as a result of the fire and smoke, he said. The extent of that damage is not yet known. Haartz Corp. manufactures automobile products, including vehicle covers, and involves work with vinyl and plastics. Mutual assistance came in from the fire departments of Concord, Westford, Boxborough and Maynard. OHSA officials are on the scene, and the cause of the fire is still under investigation. The agency said there have been three safety-related incidents at Haartz in the past five years, including two that resulted in monetary penalties. "The regulatory authorities are aware of the situation and are already onsite," said Doug Bishop, Haartz's director of quality engineering. "Safety is our first priority and we will continue to update the community as we know more."